Football has evolved into a much faster, intensive and more competitive game, with physical and technical demands increasing substantially over the past few years. Football training and match volume have increased due to the progress of professionalism in football. Even if the risk of injury has not increased in the same way as training and match volume, injuries are still of concern. Knee injuries in football are common and constitute a serious problem regardless of gender or playing level. One of the most severe and common knee injuries is the rupture of the anterior cruciate ligament (ACL). Due to the long lay-off time from football, it is causing a threat for the athlete’s career. 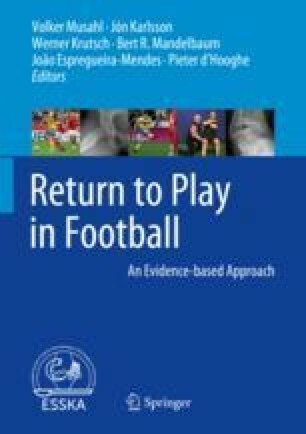 Currently, at least 6 months are recommended before patients are allowed to return to contact or pivoting sports, although there is little objective data regarding the optimal time for a safe return to play. Many “return-to-play” criteria have been suggested; however, there are still uncertainties between time-based vs. criteria-based return-to-play decision; some are based on the time from ACL reconstruction only, while others combine time with subjective and objective criteria. The back in action (BIA) test battery has been designed for sportive users in healthy conditions or in any phase of a recovery period after an injury. A dynamic measurement of balance, agility, speed and strength is conducted and further compared in respect to normative data from a large group of healthy individuals. As a further optional outcome, a back to sport indicator (BIA indicator) is provided.